“What is my curl pattern?” is the most frequently asked question in Curly Q&A, and for every photo that is shared, there seems to be a few things that consistently go unnoticed. First, I want to acknowledge that curl pattern is helpful when addressing styling and a few hair care tips like lightweight products versus heavy products, but it is probably the least important factor when it comes to hair care. Other factors like porosityplay a larger role in how you care for your hair than curl pattern. But if you are new to the curly community, or perhaps if you've been here a while and haven't figured out this curl pattern stuff yet, then there are a few things that could be hindering your pursuit of your curl pattern. Stretched styles (e.g. twist out, braid out, etc.) will not give a proper representation of your curl pattern. Also, wet hair is not a proper depiction, as the water is weighing it down. After cleansing and deep conditioning, shingle a moisturizer and styling product throughout your hair with your fingers, and allow your hair shrink as it dries. Some say you can identify your curl pattern in its wet state but a wet 4a can easily be mistaken as a dry 3c, so a shrunken wash and go in its dried state is the most accurate way to make an assessment. Put the comb down. There is nothing wrong with using a comb to detangle or even style, but combing separates your natural curl alignment/curl definition. The best way to observe your curl pattern is after it has been washed and not styled with tools. I know it is a natural tendency to comb your hair in order to style it, but this only disrupts the curl definition. Let’s not be in denial. You mean to tell me that the leave out that you kept straightening to match your weave or extensions is 3b but the rest of your hair is 4b? If you use heat tools frequently, then more times than not that is why you cannot figure out your curl pattern. Give your hair a six-month break from heat styling. If the texture at the roots is different from the length of your hair, then you definitely have heat damage. Much like transitioning with relaxed hair, without cutting the damaged ends it can be difficult to observe your true curl pattern due to the weight of the damaged hair. If your hair is dry, it is less likely to maintain curl definition. Make sure your regimen is centered on putting moisture into your hair. Most of the women I know who are able to capture their curl definition are avid about deep conditioning and sealing their hair with an oil or butter. If you are using a gel with drying alcohols instead of fatty alcohols, this could be another reason your hair is dry. Everyone thought they had the same hair as Tracee Ellis Ross until it was time to cut those relaxed ends. Oh, was it just me? Trying to identify your curl pattern while your hair is transitioning is quite difficult and not an accurate portrayal until you cut the relaxed ends. The weight matters. I remember when people would show me pictures of someone with a 4a, shoulder length wash and go and say they were not going to big chop until they reached that length. My response would always be, “Well, I guess you are going to be transitioning for 3-5 years with no trims.” When transitioning, the best thing to focus on is moisturizing, deep conditioning, protein treatments, and low manipulation styles. Curl pattern is completely irrelevant. Although looser curl patterns have a higher tendency to create and sustain curl definition, frizzy hair exists for every curl pattern. Frizzy hair does not automatically qualify you as 4c and curl definition does not automatically make you a 3b. I have seen frizz and definition across the board. Frizzy, 3b hair exists just like defined, 4c hair exists. There is a difference between someone whose hair does not clump, versus someone who has frizz. If your hair does not clump into a consistent pattern while wet, then you do not have natural curl definition, and that is fine. There is nothing wrong with your hair. If your hair does have definition while wet, then you do have a curl pattern but your unique texture is just more prone to frizz without the proper moisturizing products, styling products, and techniques, and that is fine. There is nothing wrong with your hair. Remember, curl definers can only capture a curl, not create one. Learning how to master your wash and go takes time, and that still does not guarantee that frizz will be completely eliminated; it may only be reduced. Is all of this confusing? Need an example? Check out our editors Nikki and Devri in the photo above. They both have 3c hair but Nikki’s hair is very defined and Devri’s is very frizzy. More great examples are vloggers Jouelzy and Traeh (below). They both have 4c hair but Traeh has a more defined curl pattern and Jouelzy's is less defined. Some people never learn about their curl pattern and have an equally healthy hair care journey, so please do not fret. 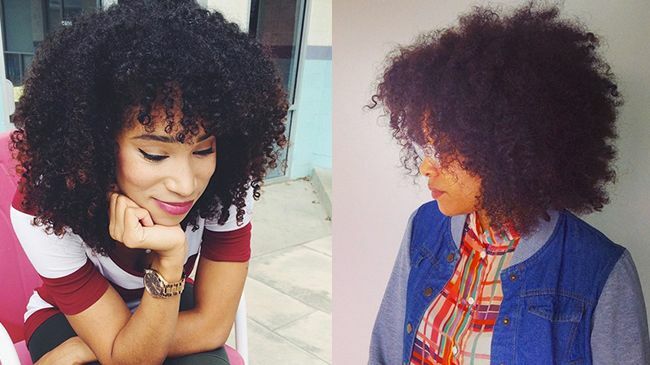 Knowing your curl pattern is not the be-all and end-all to having healthy hair. Now that you have a better understanding of what to look for, keep these in mind and take the curl pattern quiz. You can also check out this article which talks more about curl patterns and typing, dealing specifically with curl pattern changes. Do you have any tips for finding a curl pattern? Share them in the comments below!